He started out as the Facebook friend of an Egyptian-Jewish artist. Their virtual friendship developed such that he accepted to open Camille Fox's exhibition in Jerusalem last month. Farag also attended a conference at the Dead Sea organised by the Association of Jews from Egypt in Israel. 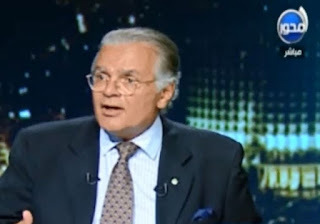 On his return home, the dapper Egyptian historian Maged Farag has boldly stuck his neck out in the Egyptian media (via MEMRI) - and called for normalisation between Egypt and Israel. Noting that in practice there already is close cooperation on security, political and other issues between the two countries' respective governments, Farag asserted: "The state is not the problem. The problem lies with the people, who still live the old ideology and the cultural heritage on which we were raised. Our generation was raised upon hatred and upon these people being barbaric..."
Indeed, despite Israel and Egypt successfully maintaining an official peace treaty since 1979, popular sentiment inside Egypt is still largely - though not exclusively - anti-Israel. Anti-Semitism is also rife in the country, which is the most populous Arab state in the world. Egypt was home to around 80,000 Jews in 1948, but expelled most of them and seized their property as part of a wider campaign of ethnic-cleansing carried out by Arab states in "revenge" for the defeat of Arab armies by the nascent State of Israel in 1948. Key to that outdated mentality was Egypt's continued support for the "Palestinian cause," Farag posited. Since Egypt had achieved a just peace with the State of Israel, there was no rational or logical reason for it to maintain any hostility towards the Jewish state, he said - particularly when the Palestinians themselves "have no interest" in actually ending the conflict, short of annihilating Israel altogether. Interviewer: You were quoted as saying that we should drop the Palestinian cause, and focus on normalizing our relations with Israel, and thus becoming its friends and buddies. Are you serious?! Interviewer: Are you talking about national security? Interviewer: I don't like them. Majed Farag: You have the right not to like them. Majed Farag: Look, there is a difference between loving them... There is no love or hate in politics and in international relations. Majed Farag: There are only interests. It is in our interest to cooperate with people of culture, science, thought, and technology - all those things that can benefit us. Majed Farag: They don't think it is in their interest. They don't want to resolve their own problem. Majed Farag: I still don't understand what the big deal is. I met many Egyptians there, and many Egyptians have visited Israel. I don't understand why my visit there made people so angry. Interviewer: Because you are Maged Farag. Majed Farag: Was I supposed to conceal my visit to Israel, and go there on a different passport, and all that? No. You know that I am not afraid. My principal is: If you are afraid, don't talk about it, and vice versa. I am convinced that this benefits my country. It is in the best interest of my country to have good relations... I won't say "friendly" relations, because friendliness is not the issue. It's about interests. I can benefit from that neighbor in many ways. You prefer to remain enemies with it? Fine. Let's be enemies. But until when? Until the Palestinian issue is resolved? It won't, and you know that better than me. The Palestinian issue will not be resolved because (the Palestinians) do not want it to be resolved. I just want to say one more thing. Some people said to me: "How can you go to an occupying country?" Occupying?! Do you have any doubt that Israel is, and will continue to be, a reality? Do you still hope and believe in the old idea of throwing them into the sea? Is that logical?! Majed Farag: I'm sure that you have heard that there is a sign in the Knesset, saying: "From the Nile to the Euphrates." Interviewer: It's from the Euphrates to the Nile. Majed Farag: No. "From the Nile to the Euphrates." Interviewer: Okay, I thought it was the other way around. Majed Farag: This is not true. There is no such thing. Interviewer: And it does not appear in The Protocols either? Interviewer: The Protocols of the Elders of Zion. That old group. Majed Farag: Look, sir, let's stick to the Knesset. Interviewer: Is there a sign saying: "From the Nile to the Euphrates?" Majed Farag: Of course not. Interviewer: Is that "for sure"? Majed Farag: Sure, it's for sure. We all know that this is not true, but people keep saying this to heat up the hostility. Majed Farag: We have had bad relations with this neighbor for 60-70 years. It is high time that these relations improved. We should first make peace with ourselves and then with our neigbors. We should think with a scientific and open mind, with our eyes set on the future. France and Germany fought for hundreds of years. Interviewer: People think they fought one another only in the World Wars. Majed Farag: Of course not. They fought the Hundred Years' War [sic], and whatever... a million different wars. They spent centuries fighting wars. Today, France and Germany have become one country. Not only have they made peace, but they have also united. Interviewer: But none of these cases is around us. The (Palestinians) are right on our border. Majed Farag: Cyprus is also on your border. Interviewer: What is the meaning of having normal relations? Majed Farag: Normal relations require, first of all, cultural exchange. I must not fear the other. So long as I fear the other, nothing good can develop. We should not fear (Israel). We should visit there. First there should be cultural exchange. There should be tourist exchange, and economic exchange. There are Israeli companies that specialize in modern drip irrigation. They have very advanced irrigation technology. We have a water problem. We have a shortage of water. Why can't we take advantage of their technology, of their thought, and of the results of their research? They used this technology to cultivate the desert, so why can't we use it here? Why can't I benefit from someone who used to be my enemy? I'm not looking to force him to become my friend. I want him as a partner in developing agriculture and industry in Egypt. Many Egyptians have dealings with Israel, but in secret. Nobody has the courage to admit it. Many Israeli companies have representatives in Egypt. I have met many Egyptians who work in Israel. They are Muslims, and they marry Jewish Israeli women. They live and work there, and they encounter no problem whatsoever. What's the problem with that? But everybody is afraid to admit this. They think that this is some sort of a crime. It is not a crime. It's very normal. This is how it should be. This is the natural development of things. actually, before WW One, there was a certain amount of sympathy among some Egyptian nationalist intellectuals for Zionism. However, as we know things developed as they did. Some of the blame for the lack of peace goes to the British who strongly encouraged Egypt to go to war against Israel in 1948, although Prime minister Nuqrashy Pasha did not want to go to war. Nuqrashy was opportunely assassinated [by the MB, the Ikhwan, I believe] and the new PM brought Egypt into the war. This is according to the version of Mohammed Hassanein Heykal, the famous Egyptian journalist and friend of Nasser. In the early years of the state, the Arab Marxist writer, Abdel-Razek Abdel-Kader, wrote several books favoring Arab peace with Israel. His books were never translated into English. Isn't that curious? They were written in French and were translated into Spanish and Italian, though not all so translated. Of course, today the so-called Left knows nothing about him or his ideas.